Almost 20 years ago, waters flooded Southeastern Texas as the effects of the Pacific Hurricane Madeline reverberated across the United States. As volunteers rushed toward the devastation, First Baptist Church of Victoria opened their doors to host the first responders. In the aftermath of Hurricane Harvey, their heart to host remains. Just one day before Hurricane Harvey made landfall, officials issued a mandatory evacuation for the city of Victoria. Again, First Baptist Church of Victoria opened its doors. “If you’re going to stay through the hurricane, why don’t you come down to the church?” Pastor Shamburger of First Baptist Church said to members who planned to hunker down through the storm. As the Category 4 thundered through the state flooding roads, destroying homes and uprooting thousands, tornadoes tore through Victoria. 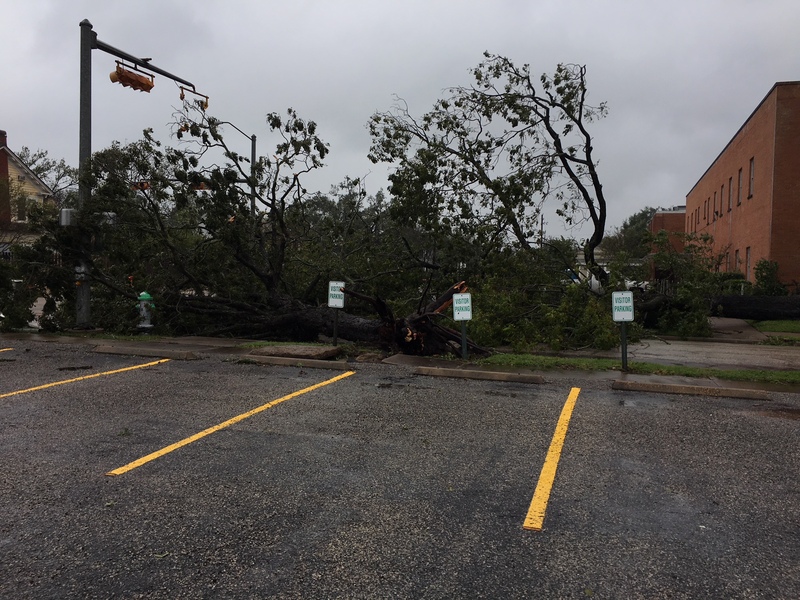 Chris Liebrum, the director of the Office of Cooperative Program Ministry for Texas Baptists, visited the site after the storm and said the damage was devastating. Immediately, the recovery process began. Shamburger said volunteers had debris from the damaged roof and fallen trees cleared the Tuesday following the storm. With more than $200,000 of damage to confront, Shamburger said he felt God telling him to challenge each household in his congregation to donate $1,000. Together, they raised $90,000. “Chris Liebrum and Fred Ater [area 4 representative] from Texas Baptists came down to see me the next week,” Shamburger said. “They began to share the damage that we had incurred through the internet.” Soon after, donations poured in from others across the nation totaling an additional $90,000. shared their name, Shamburger said. Just as they had 20 years before, First Baptist Church of Victoria opened its doors to first responders. Shamburger said the church hosted a group with Texas Baptist Men who “were the difference” in both the church’s and the community’s recoveries. Shamburger said the church intends to continue hosting other volunteer groups as more come to aid in hurricane repairs. Today, it is important to remember there are still many churches and families in need post-Harvey. If you or your church is interested in partnering with a church affected by Hurricane Harvey, please visit texasbaptists.org/church2church or call (888) 244-9400 for more information.